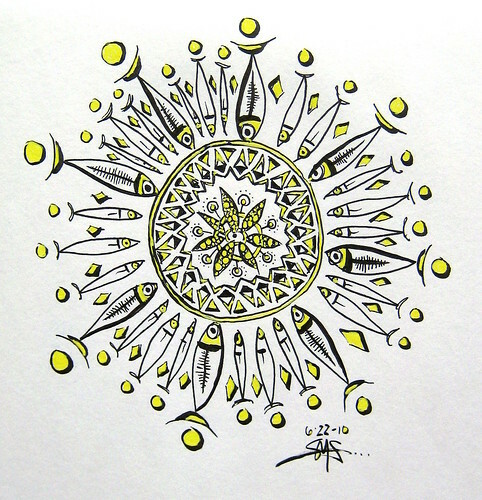 I don't usually end up with specific symbolism in my mandalas, but this one seemed to have been inspired by a recent trek to the river on a day when I decided to walk down the boat launch and get my feet wet. Throughout my entire childhood I was warned away from the river for reasons that are beyond my comprehension save for a pair of overprotective parents. For the 1st time in my 41 years, I walked into the water about calf high and was thankful for it's coolness on my tired legs. Why did I wait so long? Love the steely grey and lemony yellow! Acceptance: I am what I am. Good question.... why don't you try it? For reasons we may not yet know.